If that isn’t impressive then I don’t know what is. And this isn’t the result of a one-off fluke, because Rightmove’s revenues, earnings and dividends per share have increased every single year for the last decade. And don’t think this rapid growth is simply a recovery from the dark days of the 2008/2009 credit crunch, because it isn’t. Other than a slight dip in revenues, Rightmove sailed right through the financial crisis as if it were nothing. One thing I haven’t shown in the chart above is Rightmove’s capital employed growth. That’s because Rightmove has almost no capital assets (i.e. property, plant or equipment), so its capital employed growth rate is meaningless. In this case, ‘almost no capital assets’ means about £11 million of office equipment, computer equipment and motor vehicles, but £11 million is peanuts for a company generating net profits north of £160 million per year, as Rightmove is. The reason Rightmove can make so much profit from so little capital is that its main asset is its website, which is the UK’s most popular property portal. Even super-high traffic websites only require a few servers to run, and they cost very little compared to buildings, factories and other heavy capital infrastructure. Actually, Rightmove’s main asset isn’t its website, although the website is the glue that holds everything together. Rightmove’s main assets are property buyers and sellers who use its website. Property sellers (or landlords) advertise their properties on Rightmove because that’s where most of the buyers (or prospective tenants) are. Property buyers (or renters) visit Rightmove because that’s where most of the properties are. It’s a virtuous circle or positive feedback loop that’s also known as the network effect, and this network effect, combined with Rightmove’s position as the UK’s largest network of property buyers and sellers, is what drive’s the company’s success. It’s a type of winner-takes-all economics and in some cases it can lead to profitability numbers that are off the scale. 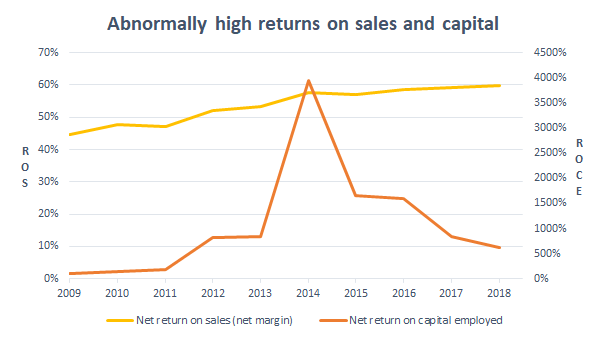 Bull point 2) Rightmove’s profitability is through the roof. Those numbers, especially the return on capital, are ridiculous. Normal companies just don’t produce returns of over 600% on shareholder and debtholder capital. But Rightmove does. These returns are not the result of having the flashiest website, or the best engineers, or the most heroic CEO; they’re simply a function of Rightmove’s position as the go-to location for buyers and sellers of UK property. The costs of maintaining the bridge are negligible, and as the only bridge in town you can raise prices almost at will (although there are limits, beyond which your customers will either shoot you or find some way to not have to cross the bridge). The bridge’s returns on sales are high because its operating expenses are low (the bridge is sturdily built and the toll booths are automated), and returns on capital are high because the bridge is old and the original value of the bridge has largely been depreciated away. So your toll bridge is a good business, but there’s a snag. There are limits to how many people can cross the bridge in a day and limits to how high you can raise prices. If traffic on the bridge is already maxed out, then a doubling of the local population won’t lead to a doubling of the traffic on your bridge (and therefore won’t lead to a doubling of revenues and profits). To double your traffic capacity, you’d have to widen the bridge or build a new bridge, but both options involve massive upfront investment. Another option would be double capacity by acquiring a bridge over another valley somewhere else, but that would also require a huge upfront cash payment. So while generating profits from the business is easy, growing those profits in a substantial way is very hard. Fortunately, Rightmove’s business is nothing like that. Unlike the toll bridge, if traffic to the Rightmove website doubles, all Rightmove has to do (more or less) is bolt on a few more servers to handle the extra traffic. If traffic doubles again, Rightmove can just add a few more servers. And relative to Rightmove’s £160 million profits, the £10 million or so it currently has invested in servers is almost laughably insignificant. Rightmove could easily afford to expand its servers ten-fold, but it doesn’t need to as there simply isn’t that much property related web traffic in the UK. So unlike retailers who need to roll out new stores as they grow, or manufacturers who need to fit out new factories with machinery, or miners who need to dig new mines and fill them with trucks, diggers and other equipment, Rightmove can grow as much as the market will allow at virtually no cost. And since Rightmove can grow rapidly without heavy capital investments or large acquisitions, the company also has no need to borrow money. Debt is useful, but it’s also dangerous and is often a key driver of corporate collapse and demise (see Carillion or Interserve for examples). Although I’ve been wary of highly indebted companies for years, I’ve become even more wary in recent months and at the start of 2019 I added a debt-to-profit ratio to my stock screen. This tweak helps low debt companies like Rightmove move up the stock screens rankings, meaning they’re more likely to end up in my portfolio. In this case, Rightmove hasn’t had any debt for years. It just doesn’t need it to produce spectacular results, so why take the risk? And as an added bonus, the company doesn’t have the risk of a defined benefit pension either. The chart above shows that Rightmove’s year-on-year growth has steadily fallen from around 30% a decade ago to just over 10% per year today. There are lots of ways around this, such as selling data on house prices to banks or selling generic advertising space on the website, but personally I think 10% per year is likely to be the upper limit for Rightmove’s core business growth over the next decade. If Rightmove does continue to squeeze more money out of what is now a relatively static number of advertisers, competitors such as Zoopla and On The Market could make a serious dent in Rightmove’s business by selling advertising space to estate agents at much lower rates. In fact, the number of estate agents using Rightmove declined by 2% in 2018 (excluding new builds), perhaps due to Rightmove’s recent price increases. I’m not saying Zoopla and On The Market are going to knock Rightmove off the number one spot, because that’s extremely unlikely. But they are likely to put a cap on Rightmove’s maximum average revenue per customer and therefore the total amount of revenue Rightmove can generate per estate agent. But then the Government and the Bank of England bailed out banks, cut interest rates effectively to zero and started ‘quantitative easing’, and the impending property bust was quickly turned into property bubble 2.0. And because of this multi-decade property boom, we don’t know what effect a prolonged headwind of falling or stagnant property prices will do to Rightmove or its share price. Does Rightmove’s share price reflect the quality of its business? On balance, I still like Rightmove. It’s the market leader in a winner-takes-all market and continued growth (albeit at lower rates than in the past) seems to be the most likely outcome. 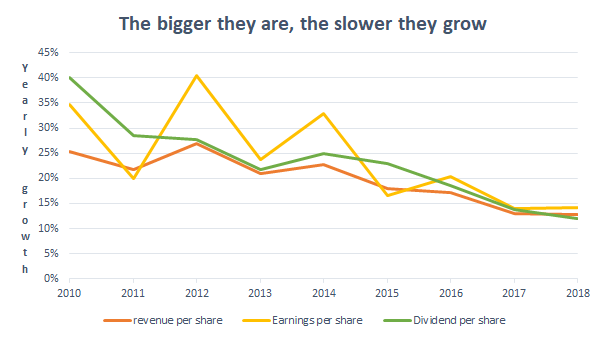 So Rightmove’s yield is less than half the FTSE 100’s, and its price to 10-year average earnings and dividend ratios are somewhere between three and five-times higher than the large cap index. To an extent this high valuation may be justifiable because of Rightmove’s impressive growth track record and its potential for impressive future growth. 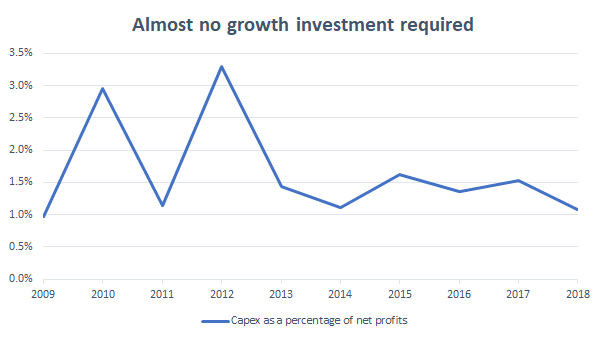 But it does introduce more risk, because shareholders are more reliant on future growth to get a decent return, and future growth is always uncertain. What if Rightmove’s lack of advertiser growth and sub-5% traffic growth effectively capped its revenues and earnings in 2019 and beyond? If the company can only generate 5% growth going forwards, then that 1.3% dividend yield starts to look very weedy. A company growing at 5% should have a yield of at least 2%, and more likely 3% or more. But for Rightmove to have even a 2.6% yield its share price would have to halve, and I suspect a 50% price decline would not make its shareholders very happy. So does that mean I think Rightmove is massively overvalued and likely to see a huge price decline if its impressive growth falters? Not necessarily, because Rightmove is a bit of a special case. Each year, Rightmove buys back a significant portion of its shares. In 2018, buybacks totalled £114 million compared to dividend payments of £55 million. In theory it doesn’t matter much whether a company pays out cash as a dividend or uses it to buy back its shares, but personally I’m not a fan of massive buybacks. I would much rather Rightmove switch its returns priority to dividends first, buybacks second. For example, if Rightmove paid a 19.1p dividend, it would have a 3.7% dividend yield. Its growth rate would drop by a couple of percent, but I would much rather have the dividend paid to me so that I can reinvest or spend it as I see fit, rather than have Rightmove’s management buy more Rightmove shares on my behalf. 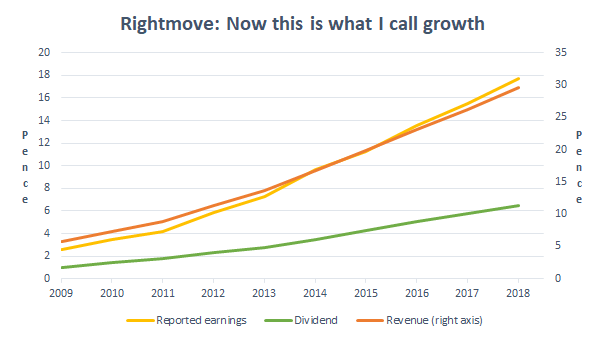 Ultimately this doesn’t matter from a total return point of view, so given Rightmove’s competitive position, impressive track record and 3.7% shareholder yield, I would quite like to buy Rightmove at its current price. But as a dividend-focused investor who likes the flexibility of dividends and who does occasionally spend rather than reinvest dividend income, I’m not so sure. Yes, I could just sell 2% of my holding each year to turn those buybacks into a ‘dividend’, but that’s a) expensive and b) a pain in the backside. What opportunity do you see for Rightmove to use its cash and capability to set up or buy similar operations elsewhere – perhaps the best and biggest markets have competition but there are still many markets behind the UK’s internet penetration curve. I think there’s a big difference between buying and building a property portal overseas. 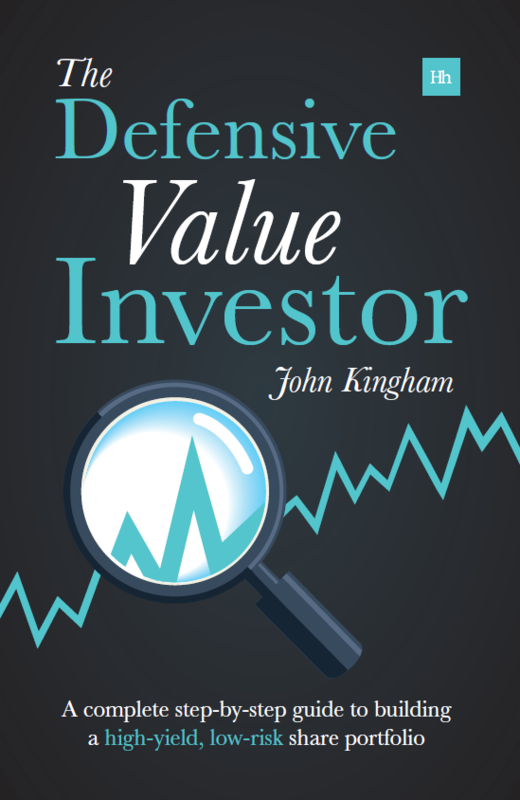 Any idiot can buy a company as long as they can borrow enough money, and the return on that investment may not be anything like as good as Rightmove’s return on capital because it would be a function of the price paid for the business rather than the abilities of the business itself. As for starting up an overseas property portal from scratch, it’s much cheaper and very easy, but the network effect which protects Rightmove in the UK would, I suspect, protect the leading portals in overseas markets. Rightmove could go to an undeveloped market, but those markets are likely to be very small and not very profitable in the early years as the portal has to build scale, and building scale is expensive (i.e. lots of advertising and search engine optimisation). But if Rightmove was patient I don’t see why it couldn’t be done. Overall then, while international expansion is possible, I don’t think it’s going to make much difference anytime soon, unless Rightmove levers up and makes a big acquisition, which I’m not a fan of. There are other options though, such as moving into related areas like mortgages, utilities, home furnishings etc. This is the route Zoopla has gone down. It’s less profitable but can still be worth while. ‘……but I would much rather have the dividend paid to me so that I can reinvest or spend it as I see fit, rather than have Rightmove’s management buy more Rightmove shares on my behalf. I disagree – Rightmove’s new pricing policy will only encourage cheaper competition either from within Rightmove’s lower margin product-range or elsewhere as appears to be happening already. Rightmove share buy-backs during a period of historically high share prices using investor’s money is contrary to both probity, fairness & common sense & (although not alone) shows a misalignment between the interests of Rightmove’s owners (shareholders) & employees (mgt) who have done little to add value for investors recently. A reckoning of the above will expose this folly in the event of future share-price under-performance. I think there is little excuse for Rightmove share buy-backs at any time & none in a property market in decline which may or may not be imminent. Hi J, You may well be right. 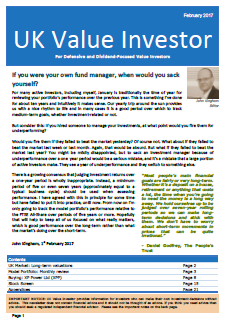 In terms of buybacks or dividends not making a difference from a total return point of view, I should have said ‘if the market is efficient then it doesn’t matter’. In reality there is always a difference, sometimes in favour of buybacks, sometimes in favour of dividends. For example, you may feel that you could get a better return if Rightmove paid a bigger dividend and you could invest it elsewhere, rather than having that money reinvested for you into more Rightmove shares. In that case, if Rightmove paid out more dividends instead of buybacks then your total expected return would go up. As for Rightmove’s price increases, there are always new ‘prop tech’ startups trying to get in on the action, and I agree that Rightmove hiking prices may make it easier for these startups to get traction, or for Zoopla to close the gap to Rightmove. I don’t agree that high share prices are necessarily bad for buybacks. It depends on the ratio of share price to intrinsic value (i.e. whether the shares are cheap relative to future earnings and dividends) and not whether the share price is high relative to its own past. A record high share price can still be a bargain purchase, although usually this isn’t the case. Finally, I think Rightmove is quite attractively valued, so I don’t have a problem with it buying back so many shares, at least from a valuation point of view. But from a personal point of view I would rather it paid out a bigger dividend, as that would give shareholders more flexibility in what they do with the company’s excess cash flows. This shows a lack of barrier to entry i.e. if you have to invest such a small amount to grow profit it will attract competitors. Rightmove also operates in a sector where switching costs are low for its customer. Therefore if a new website emerges and offers a lower price it will be able to capture a portion of Rightmove market. The only thing Rightmove can do to retaliate is to lower the price. Currently, it might seem inconceivable but these things tend to happen. Look at all the new streaming platforms emerging thanks to Netflix success. On the other hand, even though Facebook is extremely profitable the switching cost to alternative sites are higher i.e. people have taken time to upload photos and built a virtual network of friends it’s harder to leave this website. This is why despite Facebook is nearly 13 years old no new competitor has emerged. The closest website to Facebook is linkedin but its completely differentiated itself from Facebook and targets a different audience. Hi Reg, I agree; very low capital requirements do tend to make it easier for new competitors to get started. The barrier, as with Facebook, is in the existing network of users, i.e. buyers and sellers of property. And speaking of Facebook, I think it has almost no durable competitive advantages at all. With each wave of new kids growing up, we see another wave of alternative social media networks (most of which I have never heard of). The start up costs are trivial, the technology is trivial, so there are just endless numbers of these things popping up all over the place. All it takes is for one of them to gain traction with a few million kids, and for the founders to not want to sell out to Facebook, and Facebook could be relegated to being a social network for old codgers. Having said all that, I never use Facebook so I’m not exactly an expert on why people use it! Personally, I’m not a fan of facebook but I do think Facebook is in a stronger position on holding on to its current user simply because the users have invested time and effort into the platform. On the other hand, if we look at Rightmove, it is simply a platform used to advertise a property. Therefore, an estate agent can use a different platform to advertise subsequent properties. As a result, it has no captive audience. The estate agents have not built up a catalogue of data which they have to upload into another platform. This is why Rightmove is unlikely to sustain its market share when new competitors emerge.